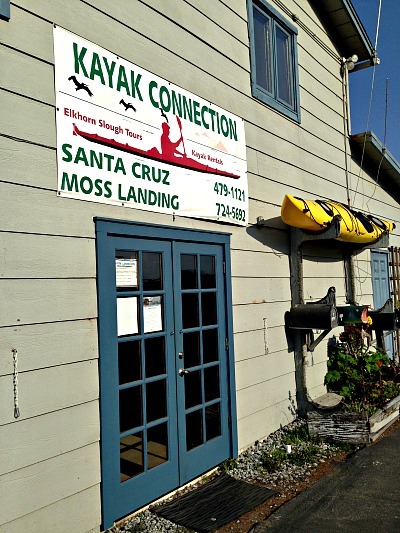 Moss Landing is part of the waters of Monterey Bay that occupy a hundred miles of indented coast were the most over fished and polluted anywhere in California a hundred years ago, and now are among the best you can find anywhere along the Pacific Ocean. Gone are the days of unrestrained whale slaughter and giant sardine factories where waste products from overfishing made these waters a place where no visitor would want to go. 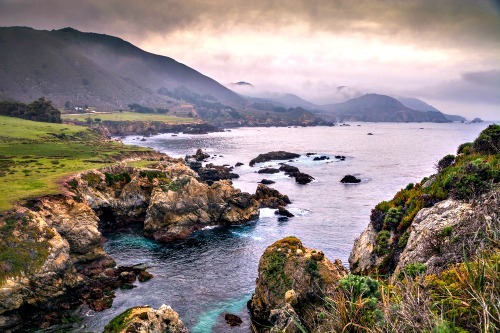 Now, it's a marine biologists dream, with dozens of marine mammals, almost a hundred species of seabirds, over three hundred species of fish, and even several species of turtles all residing in what is called the Monterey Bay Submarine Canyon. Within this canyon there are giant kelp forests, larger than anywhere in the world and where plants can grow fourteen inches a day and are about one hundred feet tall. Humpback, Right, Minke, Sperm, and Blue and Grey whales come from Alaska on their way to annual breeding grounds in Baja Mexico and are often seen within a dozen feet of several location along the Monterey Bay. The upwelling of nutrients from the deep cold waters of the canyon create the perfect opportunity for a diverse web of live that makes so many creatures call this coastline home. 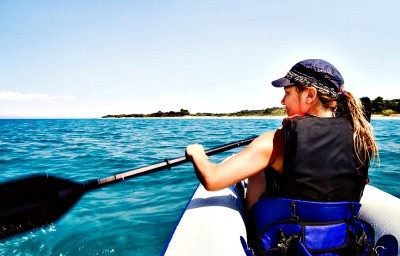 Kayaking is surprisingly easy as long as you go with the tides! 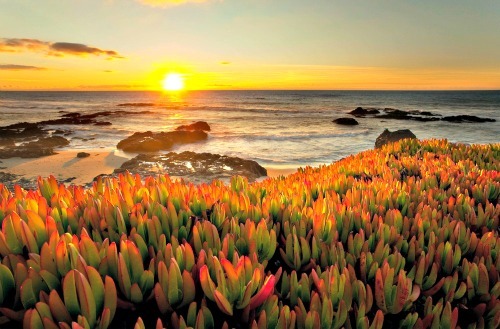 A short car ride of 20 minutes to Moss Landing north of Monterey, is a reward in itself just when you might be weary of shopping, and the quick pace of your well planned vacation. 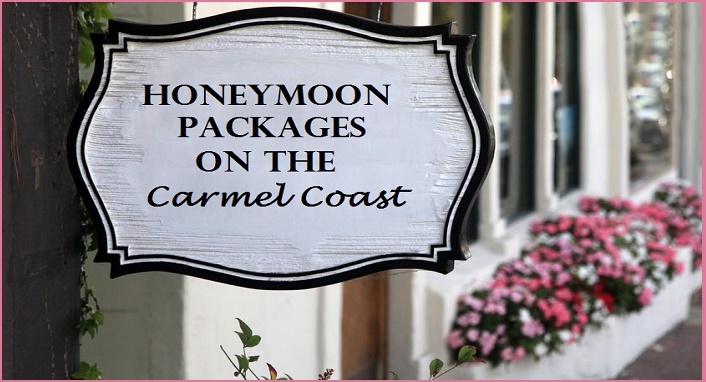 This quaint and surprisingly charming town, is a wonderful and refreshing departure from the busy streets and touristy crowds that you sometimes see in Carmel and Monterey and it is surprisingly romantic. Touring the waters in your own kayaks can that unexpected inspiration that leads to good conversation and a closer connection with each other. 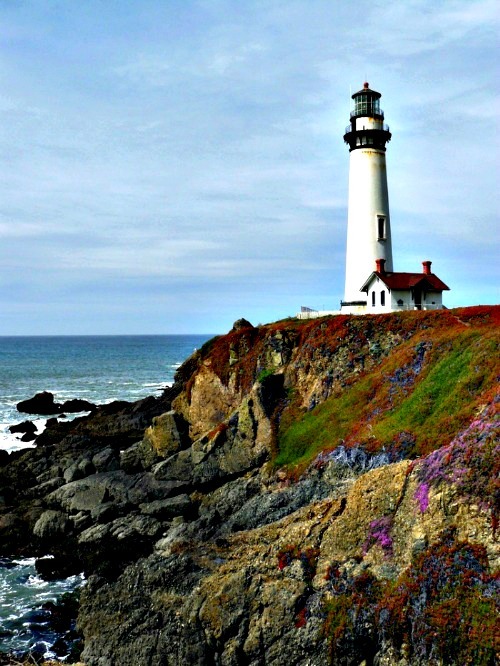 This natural wonderland has been called one of "The Ten Greatest Places to see Wildlife along the California Coast" by and is a place where you don't have to look through thick glass-like panels of an aquarium wall, to see tiny sea otters or harbour seals cavort and play. Here you can see them by the hundreds (One reader counted 337 in one day) in their natural habitat. Consider that Captain Charles Moss built a pier here out into the waters of the Pacific Ocean before the railroad arrived, and shipped fresh local produce from the perfect loam soil of Salinas Valley up north to San Francisco and surrounding local towns. 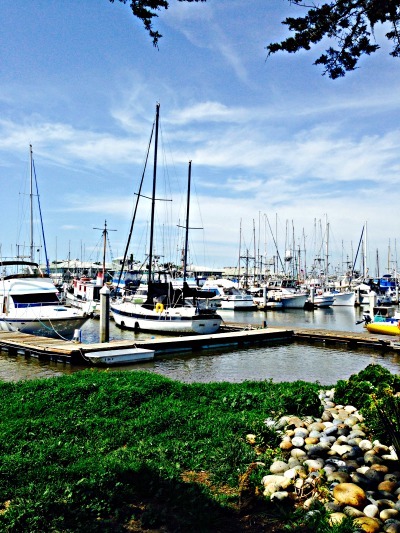 Moss Landing is still a busy fishing port with hundreds of boats going out every morning to fish for salmon and tuna, crab, and a long list of other fish species. The town is small and charming, and reminiscent of older times when this was a center of activity along the central California coast. There are a few streets set aside with antiques treasure stores and buildings that date back to a simpler time. Unusual and dollar smart treasures can be found here if you spend some time to uncover the history. I have visited here on several occassions, and on my last visit, I purchased a 1960's vintage copper and black three bladed ceiling fan used in a butcher shop in central California. It was used, as was typical during that era, to to keep out the flies. If you like antiques and you enjoy history, wildlife, whale watching and good food, you might just like this spot just a few blocks right off of Highway 1. Just look for the twin PGE towers that are the well known landmark for this destination. Get up close to these Killer Whales! 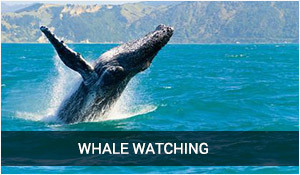 If you think whale watching tours are bland and usually uneventful, then we strongly suggest that you consider Sanctuary Cruises right here in Moss Landing for your whale watching adventure. 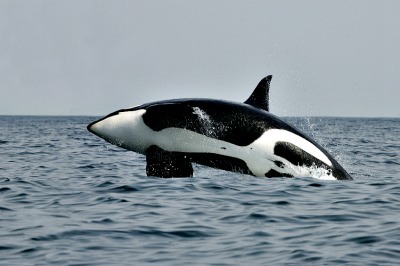 If the idea of seing beautiful black and white Orca's breaching all the way out of the water...sometimes repeatidly, and the ideal of maybe seeing leather neck turtles appeals to you, than this cruise out of Moss Landing is your best choice. 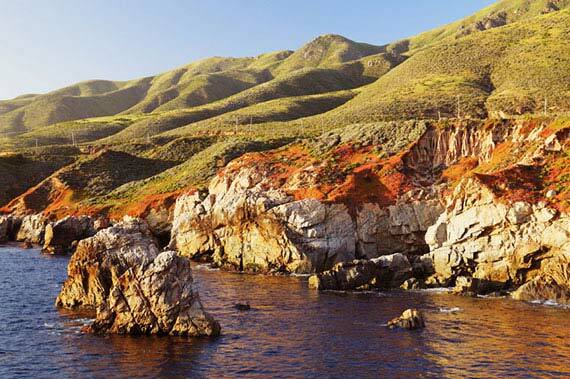 Captain Mike and his marine biologist specialist's will take you on a wonderful journey out to sea right at the point where the incredibly deep Monterey Canyon begins and where the whales including Orcas and Humpbacks love to roam. Go during the Summer if you like the idea of really large whales, and during the Fall if calm waters and a more serene ride is your idea of a good time. But if your concerned about becoming sea sick, the Sancturay crew has a bit of good advice for those who might be prone to sea sickness. 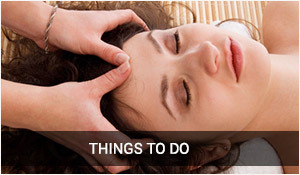 Their remedy enjoys a 95% rate of success when combined with motion sickness medications and they are determined that you have a successful excursion. 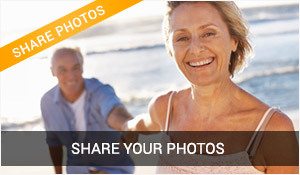 The secret is an electronic wrist band that has adjutsable levels that seems to work with almost anyone and most all of the time, especially if you take Bonnine or other anti-motion sickness medication in the evening and then again in the morning. Eat a bland breakfast and know that the crew on the Sanctuary has experience with lots of passengers of the many years they have been in business and have soda crackers and carbonated water on board to keep you feeling well. The Sanctuary is a clever 37 passenger boat that is designed to have you as close to the water as possible so you get a great experience and of course...outstanding pictures. The tour costs about $50 and lasts from 4 to 5 hours... sometimes 6 hours if lots of activity is happening. On one recent tour, Orcas were breaching completely out of the water over and over early in the morning. While no two days are the same, most whale watchers see many varieties of whales including humpbacks and lots of dolphin, as the crew knows this part of the ocean very well and searches tirelessly to find you the best experiences. These are great people to be around and they are always positive and enthusisatic. Location: 7881 Sandholt Right near the KOA RV park. Meet at the edge of the water. 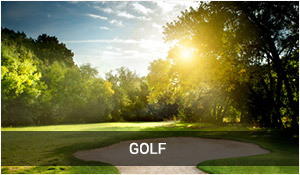 Dress in layers, take sunglasses, a hat and remember to eat a light breakfast...and have a great time! 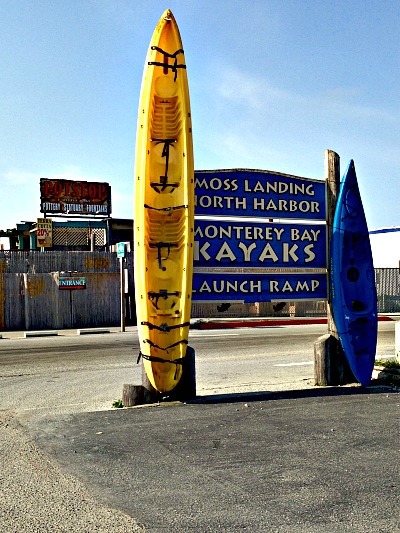 Rent a kayak while you are here! If you don't want to rent a kayak ... take a silent boat tour! Watch for this sign from the highway! 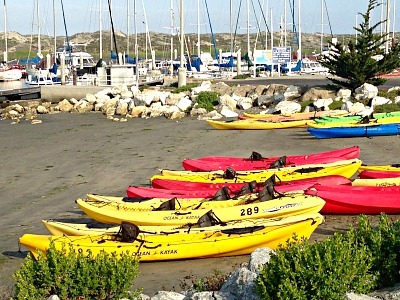 Moss Landing is a great place to rent a kayak and enjoy all of the sea otters and harbour seals, as well as over a hundred different types of bird life that many will pay big dollars to see at the Monterey Bay Aqaurium. On your visit you are likely to see perigrine falcons, pelicans, red tailed hawks, sandpipers, shark and maybe even wayward deer...its all here. This can really be a romantic adventure if you take this one word of advice ... Get a kayak for each of you. Nothing ruins a romantic mood faster than when you can't agree when to turn left ... trust me! 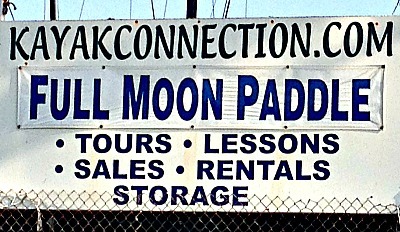 You can rent a kayak at Kayak Connections which is just a short couple of miles from Moss Landing. Reservations: 831.724.5692 I suggest that you take the early morning tour when the winds are low and its not too hot if you can. Bring cash for the $4 parking fee and lots of suntan lotion. If you prefer, and it's really a great choice for many, you can also take a guided electric pontoon boat tour led by Captain Gideont. 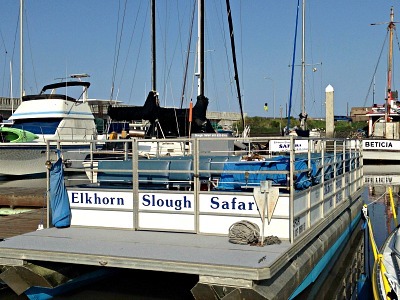 His 27 foot boat winds it's way back miles where wildlife can be found feeding and resting for their next journey. During your visit, you absolutely must make it a point to stop in at Phil's Fish Restaurant and Market. 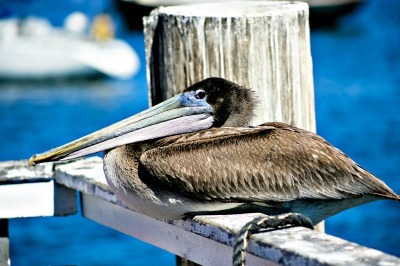 This place is a bustling restaurant that receives it's wide variety of fish right off the local boats that return late morning or early afternoon. Phil's had been reviewed by dozens of magazines and newspapers... all letting visitors to this little known place on the coast know the value and culinary excellence of his fish and pasta. The ambience is busy and eclectic but the food is sooooo good. His Cioppino is a classic and always gets great reviews. Try the crab sandwich... another favorite, or the blackened scallops. If that dosent satisfy your palate, try the snapper or salmon sandwich...guaranteed to make you happy and ready for your evening beach walk back in Carmel. 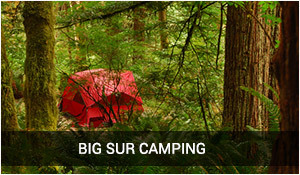 This would be a great stop after your early morning whale watching venture at with Sanctuary Whale Tours. 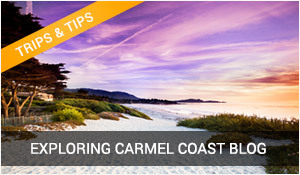 If you have had enough of the mention of fish and the smell of the ocean at Moss Landing, then head on back to the Carmel Beach for some slow walking, or drive a couple of miles to the Terrace Lounge at the Pebble Beach Lodge. 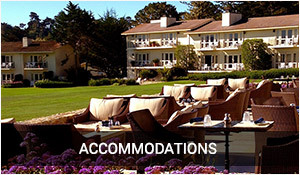 Rest in their overstuffed chairs with views of the Pacific Ocean at it's best, and then linger and watch the sun set over the world famous18th hole at Pebble Beach. That woud be a memorable day!